I don't know but this maybe a interesting one Scania L113TRB 14.5m with Ansair Bodywork. Or alternatively Volvo B12BLEA bendy bus. I prefer a VST over a SBV. VSTs seem more common it would suit the Manly Map very well as Brookvale depot operates a fleet of Volvo VSTs in IRL. The map I am currently creating utilises VSTs, SBVs, and older Custom bodies. So, I'll wait and see, for now, VST, SBV, and potentially your suggestion. I expect to finish the SBV quite soon, then begin the VST. Has there been any progress on the buses since Jan? SydRailPhotographer wrote: Has there been any progress on the buses since Jan? Yes the project is still in development, however a map for the game was abandoned. Currently in development is a Bustech SBV (2010), Bustech SBV (2015), and a Bustech VST (2015). At this point in time we are looking towards beginning a CDi once one of the SBVs becomes completed. 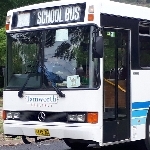 We are taking suggestions if you would like a certain (Australian) bus by certain year or variant, then please do let us know. Sorry for the late reply too, just haven't come on Bus Australia in a while. Hi, I'd like to a request a Custom Coaches CB80 Volvo B7RLE/Scania K280UB, Custom Coaches CB60 Volvo EVO 1 (I'm fairly sure someone requested this already but that post isn't showing up so I'll add it anyway)(15xx-1610 and 48xx-4831)and EVO 2 (4832-49xx), Volvo B10BLE APG Orana (38xx-39xx series), Volgren CR228L Volvo B12BLE (1611-1660 series). I know this is a lot of requests and I am also not expecting a release date anytime soon (nor am I expecting you to complete them all), but I thought I'd request these buses now while I've got the opportunity. I'm glad someone is finally making Australian, in particular STA buses for OMSI. I think these would be a great addition to the Manly Map! Do you think that a Volvo B12BLEA Euro 3 Custom Coaches CB60 Articulated would be possible please? The fleet numbers are 1661 - 1667, 1668 (Metrobus), 1669 - 1694, (1695 was destroyed by a fire at Mosman), 1696 - 1700, 1701 (Metrobus), 1702 - 1745. There's also 1746 - 1750, but I'm not entirely sure about what's after 1745. I'll get back to you on that. Can you try making a Mercedes Benz O500R/O500RF/XBR with BCI bodywork please? Plain white suits me, but whatever you are going to do does as well. A specific registration (If you need it) is CD.07.SK which is a New South Wales plate and is yellow. Hey, I would like to know the current progress of the project. donek wrote: Hey, I would like to know the current progress of the project. There has not been much project. I contacted the person behind the project and offered my assistance. We exchanged a few emails then dropped out of contact, so unfortunately this project is at a standstill for the foreseeable future.